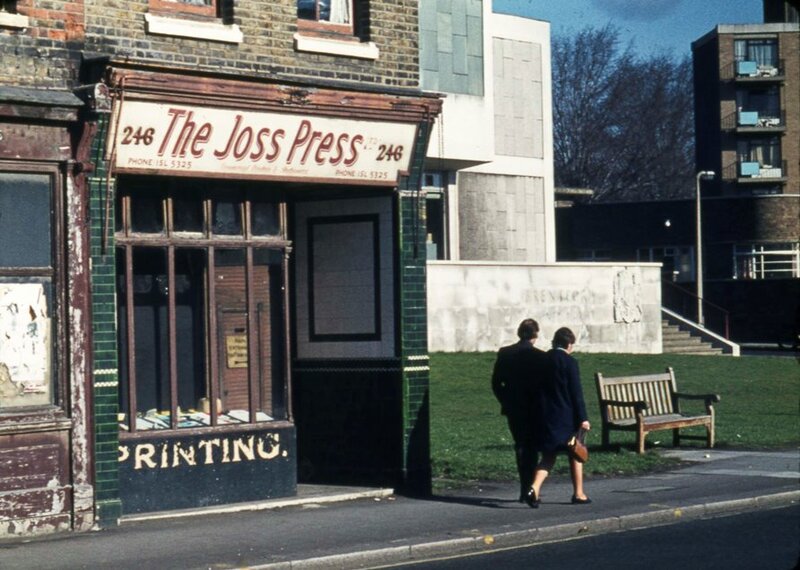 Peter Young's photo was taken on the 2nd March, 1974 and shows the derelict Joss Press at 246 High Street, the last property of a terrace. New Spring Gardens was to the right looking at the photo. The terrace was demolished within a few years of the photo being taken. The green tiles may be a legacy of the property being a provision merchants and then a butchers during the first half of the 20th centry: more details of this property. The 1939 Register provides details of the occupants at the outbreak of WW2 and thesite also has a slightly later photo taken from a different angle. Peter adds 'in the 1950s, as a member of St Paul's church in Grove Park, we used to get the Joss Press to print flyers and so on for Garden Fetes'. The photo shows new buildings to the right - the first is 'Brentford County Court'. This was built 1963 as a purpose built Court. It had previously operated in the Vestry Hall. The entrance is in this side road to reduce traffic congestion (Edith's Streets - includes a link).